Take a pan and boil water. Add broccoli florets and boil it for 4-5 minutes. Drain the water and keep it aside to use it again. Keep drained broccoli aside. Take a pan and heat butter. Add all purpose flour and saute it for a minute or two. Add onions, garlic and saute it for few minutes till it becomes translucent. Add broccoli, reserved water and let it come to boil till broccoli is cooked and tender. Let it cool slightly. Meanwhile, heat the milk and keep it aside. 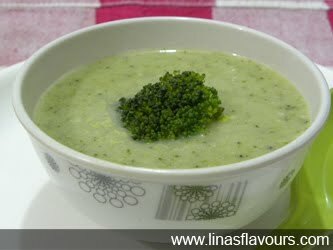 Blend broccoli well and keep it again to simmer. Add milk, oregano and let it simmer on low flame. Add salt, pepper and mix it well. Garnish it with broccoli florets and serve it immediately.